Millennials are a coveted demographic for a number of industries, not least of which the financial services sector, but their habits, preferences, and attitudes can seem contradictory, impenetrable, or hard-to-parse. Although there are a number of well-worn tropes and stereotypes when it comes to millennials, as we shall see, a closer look at this quixotic generation yields plenty of surprises. What is a millennial, exactly? When we decided to look it up, many of us at Arro Financial Communications were surprised (and maybe a little bit nauseated) to discover that all of us are, in fact, millennials. According to the Pew Research Center, anyone born between 1981 and 1996 technically qualifies as a millennial, at least by their own definition. Our generation came of age and first entered the work force during the Great Recession, which has had an outsized impact on a number of important life choices, including when and whether to get married or buy a home, how much to save, and what investment choices make sense. The millennial generation is also defined by its close relationship with technology. Millennials are what you might call “digital natives”—that is, we speak the language of the internet fluently. Although we’re painting with fairly broad strokes here, those are by-and-large the outlines that delineate this important group. But why are millennials so important anyway? For starters, millennials have sheer numbers on their side, accounting for more than a quarter of the U.S. population. Millennials are projected to overtake Baby Boomers as the largest living adult generation in 2019. Those huge numbers translate into tremendous purchasing power. Every year, millennials spend roughly $600 billion, and this generation’s purchasing power is projected to grow to an astonishing $1.4 trillion annually—30% of all retail sales. Millennials are also a growing force-to-be-reckoned-with when it comes to investing. The generation stands to inherit a staggering $30 trillion from Baby Boomers over the coming decades. They’ll need to decide how to invest that money, and which advisors are best-suited to fit their needs. Unsurprisingly, financial services firms are eager to grab a piece of that $30 trillion pie. Do the stereotypes hold water? Conventional pop culture stereotypes would have you believe that millennials are an undifferentiated mass of Urban-Outfitters-shopping, avocado-toast-chomping, heavily indebted slackers, glued to Instagram and still living in their parents’ basements. Is it all true? Sort of. 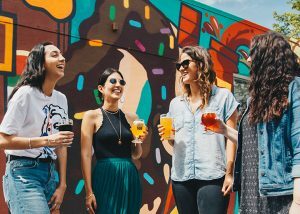 We won’t comment on our generation’s proclivity for brunch or fast fashion, but it is true that the average millennial carries $42,000 worth of debt. What you might not guess from recent headlines is that millennials are also better prepared for retirement than their parents. In fact, the millennial generation is the most likely of all demographic groups to be prepared for retirement: a J.D. Power & Associates study found that almost two thirds of millennials have at least $25,000 in total retirement savings, with 27% boasting more than $100,000. And while it might be true that millennials love their Instagram (59% of millennials are active users), it doesn’t necessarily mean millennials don’t value a certain human touch when it comes to financial advisors. Another J.D. Power study found that the most important factor when it came to millennial loyalty to financial advisors wasn’t technology, but a close relationship with their advisor. Still, millennials are the most likely of all generations to be crashing on their parents’ couches: in 2016, 22.5% of millennials still lived at home, up from 13.5% in 2005. The millennial generation—our generation—is already one of the biggest-spending demographics in the country, and it’s only set to grow as we begin to invest. Although in some respects we can behave true to stereotypes, financial marketers should take a closer look at the details if they want to grab a piece of the $30 trillion our generation is set to inherit over the coming decades.